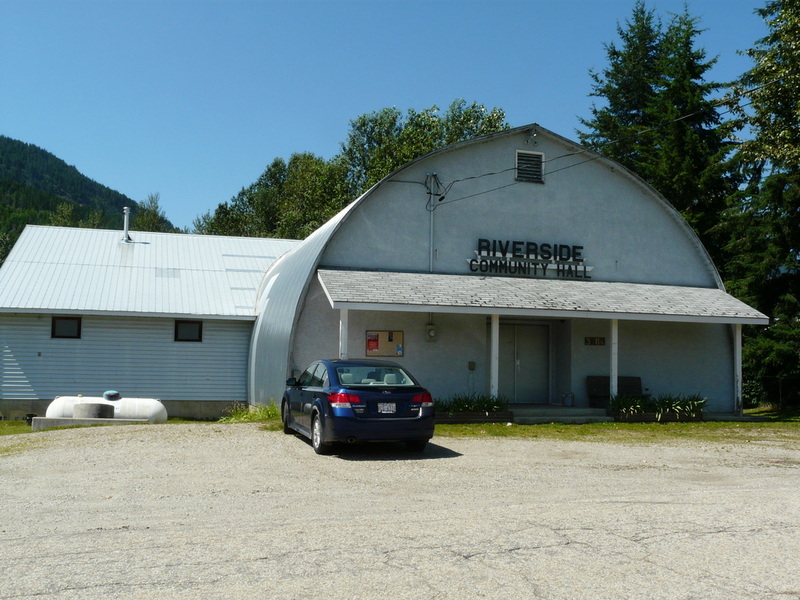 The Riverside Community Hall and the hand launch are owned by the community through the non-profit Riverside Community Club, for the benefit of and use by the community. Our mission is "to foster and promote sporting, recreational, charitable, educational and social activities." Click here to find out more about our upcoming events. We are located 10.9 km east of Enderby, BC - 9.9 km on Cliff Ave (which becomes Enderby Mabel Lake Rd after the bridge) and then just after the Ashton Creek Store, right on Trinity Valley Road, and then it's 1 km to the hall which is on the right, just before the Trinity Valley Bridge. Click here for more about our location. Riverside Hall has a 2,300 square foot main hall plus a stage (maximum capacity of 210 people), adjoined by a large kitchen and washrooms. It is available for rental to responsible groups. Click here to find out more about renting the hall.